Sometimes you're in the mood for a cocktail, but not up for the bar scene. With ReJigger, an innovative, all-in-one bar tool, you can easily make cocktails right at home. No bartender required. Most mixed drinks are comprised of 3-4 ingredients with similar ratios (usually 1-2 alcoholic components with something sweet or bitter added), but you need several tools to mix and measure. Product designer Marcus Wang pared down the equipment with one jigger that's divided into 3 sections, easily fits atop a glass, and converts into a shaker. Voila! A perfect cocktail every time. Made in America, this super durable, BPA free, dishwasher safe solution lets you enjoy your own concoctions anywhere, the beach, a picnic or a tailgate party too. The kit also includes a pint glass and a recipe guide to get you started. Cheers! We’re very excited to bring the Home Cocktail Revolution to The Grommet! 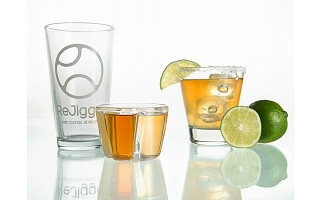 ReJigger is a new bar tool that makes it fun and easy to create delicious craft cocktails at home. We hope you join the revolution. Is ReJigger made of silicone? Dishwasher safe? What are the ratios/volumes of the three compartments? @Martha The ReJigger is made of Eastman Tritan, which is a durable, BPA-free, plastic used in many water bottles and baby bottles. It is Dishwasher safe. The volume of the 3 compartments is 2 oz., 1 oz, and 1/2 oz. Cheers! Hey Marcus- given the size of the individual compartments, I assume you could make 1-2 drinks at a time using the same pint jar? Thanks! @andrew The ReJigger is designed to make 1 drink at a time, but it's so easy to use that cranking out multiple drinks is a snap! Sometimes you're in the mood for a cocktail, but not up for the bar scene. 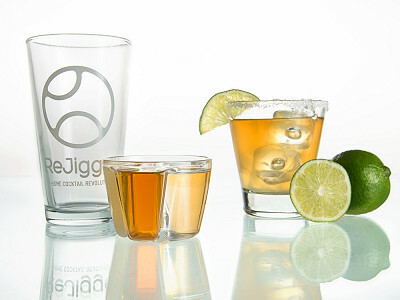 With ReJigger, an innovative, all-in-one bar tool, you can easily make cocktails right at home. No bartender required. Most mixed drinks are comprised of 3-4 ingredients with similar ratios (usually 1-2 alcoholic components with something sweet or bitter added), but you need several tools to mix and measure. Product designer Marcus Wang pared down the equipment with one jigger that's divided into 3 sections, easily fits atop a glass, and converts into a shaker. Voila! A perfect cocktail every time. Made in America, this super durable, BPA free, dishwasher safe solution lets you enjoy your own concoctions anywhere, the beach, a picnic or a tailgate party too. The kit also includes a pint glass and a recipe guide to get you started.